One main goal of mine as a speaker and former educator is to give back and help prepare new teachers for the challenges of working in the K-12 school system, while maintaining their drive and enthusiasm. ​To do so, I put together a motivational and educational program on how to keep the passion strong as a new teacher, while also being able to handle and deal with some of the challenges new educators will inevitably face and may not have been trained on or prepared to handle. 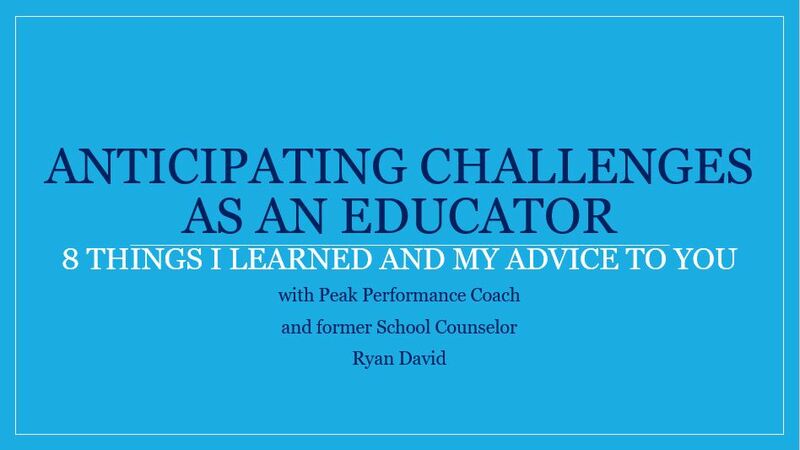 It is based on what I learned from teachers and as an educator for over a decade as a school counselor about what works and what does not work in terms of successfully impacting students. This program can be delivered to new teachers as a part of their orientation to teaching, or to existing teachers as a refresher in the form of professional development. These 8 points will inevitably help make their job easier and their lives less stressful for as long as they are working in the classroom. I am also willing to discuss incorporating a question and answer session along with my presentation if that is something that you are interested in and can make time for.